Purple Martins, while common and widespread in the east, are relatively rare and sparsely distributed in California. A combination of historical declines and the small population size led the California Department of Fish and Game to designate the Purple Martin a Species of Special Concern (Airola and Williams 2008). In contrast to eastern birds, which nest almost exclusively in man-made boxes, California Purple Martins nest mainly in natural cavities in trees (with the population using weep holes in highway overpasses in the Sacramento area a notable exception). Surveys by Brian Williams in the Tehachapi Mountains near Tejon Ranch in 2000 found over 50 pairs nesting in large Valley oaks (Williams 2002). This concentration of nesting Purple Martins is extraordinary by California standards and suggests that this area may be an important stronghold for the species in this state. To determine if the martins were also nesting in similar habitat on Tejon Ranch, an expedition was organized by the Tejon Ranch Conservancy, Audubon California, and Western Field Ornithologists. 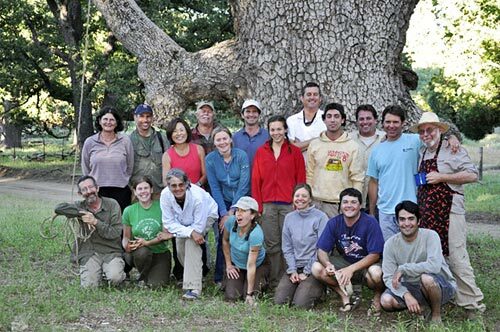 An enthusiastic crew with many decades of field experience spent the week of June 28-July 2, 2010 searching much of the likely habitat within portions of the conservation areas on Tejon Ranch, primarily on Tunis, Winters, Middle, and Cordon Ridges. We found at least 23 nesting pairs of Purple Martins, all using cavities in large Valley oaks. The general characteristics of the nest trees and sites were very similar to those found by Brian Williams. Birds usually chose one of the larger trees, generally located at or near the tops of ridges in fairly open settings. A paper on the results of our surveys will be presented at the WFO Conference in Palm Desert in October 2010. Of course, you can't keep a bunch of birders focused on just one species and we compiled an impressive list of 77 bird species (click here for list). Cavity-nesters were particularly abundant with 21 different species found. Most of us were stunned by the large numbers of Lawrence's Goldfinches, with this species outnumbering Lesser Goldfinches almost everywhere we looked. Totally unexpected was a Wood Thrush (found a week earlier by Tom Maloney of the Tejon Ranch Conservancy) which serenaded us at our campsite nearly every morning and evening (video by Dan Kopp). Williams, B. D. C. 2002. Purple Martins in oak woodlands. USDA Forest Service Gen. Tech. Rep. PSW-GTR-184.